Thanks for the reply, though I could have done without the eyeroll and the hinting rather than answering. Perhaps I missed what you are referring to, but the only thing I could find that was vaguely related was the number of "active party members." Since many real people solo and most bots party, I'm not at all sure how useful this number is for any purpose. I'm not privy to much information, but the rumor I've heard is that the folks who dominated the server went elsewhere once NA Classic opened. I would guess that this had a huge impact, both on real parties and bot parties, reducing that number greatly. I'd also guess that would have far more impact than ending looping macros. Come to think of it, though, ending looping macros would likely reduce the number of people in party at any one time, but it would not necessarily reduce the active server population. It's just that those who used to use looping macros to be "active party members" (aka poor man's bots) 24/7 now have to find parties and are not on-line in parties (and, therefore, not counted) as long each day. Anyway, that number is highly misleading. If you are referring to some other number please kindly answer more directly what number you are using. Thanks and happy hunting. im too stupid to understand. Sorry. Waiting on a response, Emeli. Am I on the right track? Thanks in advance. Holiday from 3/3 to 9/3... Or wife will kill me.... Damn! Are those xp boosts from frinteza and x2 event apply to elemental exp as well? Or just regular exp? not sure what do you mean, but if you mean XP from scrolls (Q, etc.) then no. 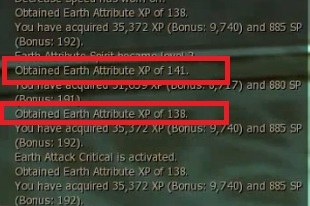 When you hunt mobs on elemental zones you get normal exp and exp for your spirit. does the frintezza +50% bonus and then x2 exp rate starting 27.02 apply to both kind of experience aka will my spirit get more exp too? It will be done this Sunday. x2 EXP server setting and normal EXP buffs do not affect elemental EXP. I'd like to cast a vote for keeping Royal Love event on for an extra week please. GentlemanJim and Sulliem like this. Hm looks like that the https://l2wiki.com/classic/Vital_Stone#Lv 2 is missing in in this post. @Yumi: I'm sorry to ask but does the Vital Stone bonus and Skill stuck too?